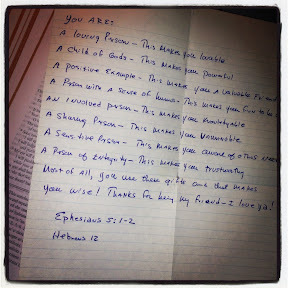 This a list of things a pastor took time to write down for me, when I was a struggling junior high student. It probably wasn't a huge deal for him - but obviously, I've been holding on to it for more than two decades. Sometimes, I just need to pull it out and re-read the positive message. Doing this, gives me a chance to have a clearer picture - or vision - of who God made me to be.